Due to the recent fluctuation in market copper pricing, selected cable assembly products will have downward price adjustments, effective Monday October 3, 2011. The products impacted include: NEMA (including Lex Loc), Stage Pin, W and SC Feeder cable assemblies. As announced in September's LiveWire, Lex Products is implementing a general price increase for all products (with the exception of bulk cable as well as NEMA, feeder and stage pin cable assemblies) effective October 3, 2011. Log in with your customer number and password at www.lexproducts.com to download this months price list. If you have forgotten your customer number or password that has recently been email to you, email us at customerservice@lexproducts.com. Lex Products recently communicated an upgrade regarding availability of online price information to all Lex customers. The upgrade outlined in last week's email announcement is effective today, October 3, 2011. As a reminder: Access to price information for your company will continue to require a company's Customer ID to log in to the Lex website. Effective today, a password is also required to access to specific pricing for your company. Your company should have received an email correspondence last week, containing the current Customer ID and your new password. If you require this information, please contact customerservice@lexproducts.com. Also effective today, the price list is available directly on www.lexproducts.com. The price lists are viewable in the "Sales & Contacts" drop down menu on the main navigation bar once logged in using the Customer ID and password. Additionally, current pricing for specific products are available directly on the product web page. The Lex team has begun to populate the new web price list and will continue to add to it over time. In addition, the current downloadable PDF price list remains. We thank you for your ongoing support of Lex and for your attention to this matter. If you have further questions, please call your Customer Service Representative or Inside Sales Representative for more information. Lex Products has recently announced the Bento Boxtm: the smallest, lightest weight power distribution box for the Motion Picture market. Weighing less than 8 pounds, the Bento Boxtm is constructed for safe, easy use, and is UL Listed. The Bento Boxtm configuration is the workhorse of the motion picture market. The new product is built from electrically insulated heavy duty PVC and is designed to be resistant to corrosion, shock and impact. Boxes are compact for easy storage and portability, and are stackable. Specifically, six Bento Boxes fit in a six-gallon milk crate for easy carrying and storage. The Bento Boxtm features a 100 Amp Stage Pin inlet to (5) NEMA 5-20, 20 Amp duplex receptacles and a feed through 100 Amp Stage Pin receptacle, commonly referred to as the "lunch box" configuration. Circuit breakers and indicator lights are mounted on the face plate for easy access and circuit identification. Typical applications include powering lights or light tools and craft services in a Theatrical or Motion Picture production. In addition, Lex is able to provide a range of customized solutions to fit additional needs for the standard Bento Boxtm designs. Contact Lex Products at 1.800.643.4460 or e-mail us at info@lexproducts.com for more information about the Bento Boxtm. Lex Products will be exhibiting at LDI in Orlando on October 24-30, 2011. Make plans now to stop by our booth 632 to see what's new from Lex. 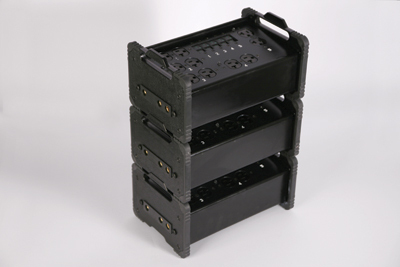 Bento Boxtm - The smallest, lightest weight power distribution box in the Motion Picture Market. EverGrip® 7 Pin and 14 Pin Molded Motor Control Cable Assemblies - Provides enhanced safety for critical motor and hoist cables now permanently molded with strain relief extending cable life. Check out Lex Products 2011 Parnelli Award nominee for Indispensable Technology, the EverGrip® overmolded motor cable assemblies. The Lex PowerGATEtm Company Switch, the industry standard for safe onstage power. Rugged Lex PowerRACKtm Rolling Racks with custom engraved side panels, lighter than competing units, contributing to a greener touring package. The portable 6k, 12k, 24k single film dimmers and Slim Dimmer Plus with full DMX functionality, the Lex film dimmer lineup is becoming an indispensable part of a film rental package. Lex's full range of nearly indestructible high impact PowerHOUSEtm rubber portable power distribution boxes. 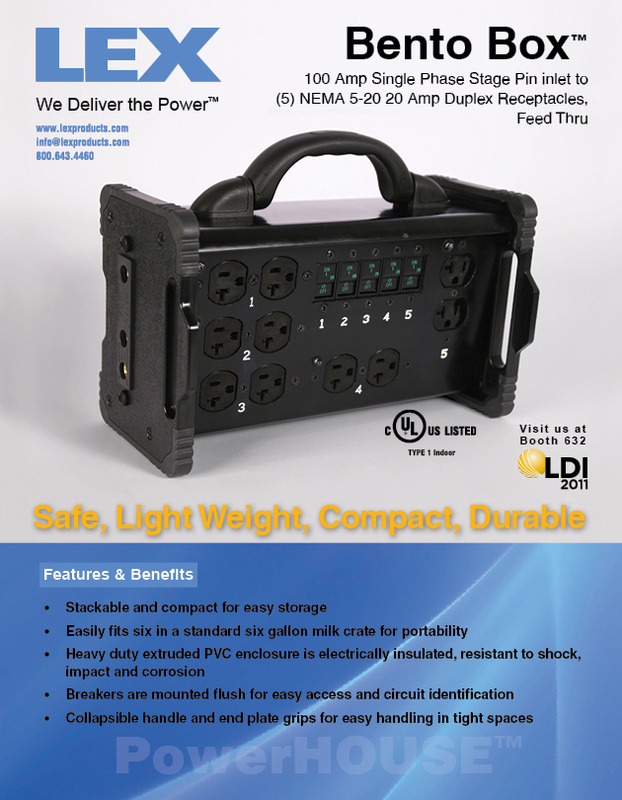 There is nothing else like it for safe, durable, portable power distribution. Lex Products has recently rounded out coast-to-coast coverage for the Inside Sales Team with two new additions. 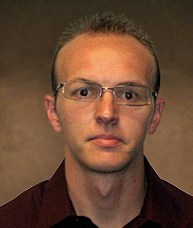 New team members now in place in the Sun Valley, CA facility are Blake Whilden and Chris Singleton. Blake Whilden assumes the role of Inside Sales Representative, South Central Region, covering TX, NM, OK, AR, MS, LA, CO, and KS working along with Territory Manager Keith Wilkerson. Blake served in the Air Force where he first encountered Lex Products when he was assigned to Air Force Entertainment. He directed the setup and teardown of nearly 300 shows, both indoor and outdoor in several countries. After leaving the Air Force he continued to work as a civilian contractor for Air Force Entertainment, as well as other entertainment companies. Christopher (Chris) Singleton joins the organization as the Inside Sales Representative, Western Region, covering CA, ID, MN, NV, OR, UT, WA, WY, HI and AK, working alongside Roland Hammerl and Territory Manager Ken Ward. Chris has developed his experience as a Technical Director, Master Electrician and Lighting Designer for over 125 theatrical productions. He has a B.A. 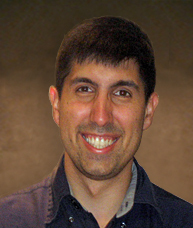 in Theatre Arts from Loyola Marymount University and has many productions under his belt. "We welcome Blake and Chris to the Lex team" says Mark Gold, Manager Inside Sales, Customer and Technical Services. "After an intense training period, both Chris and Blake are ready to be the face of Lex to the customers in their territory and we look forward to their contributions to 'deliver the power' to the South Central and Western Regions", says Gold. Blake and Chris and their colleagues on the Inside Sales team will be key point of contacts for customers in their respective territories for identifying the appropriate Lex product offering for specific applications. They can be reached at bwhilden@lexproducts.com or phone 818-827-9831 and csingleton@lexproducts.com and phone 818-827-9823. Lex Products continues to add to our presence on social media sites including Facebook, Twitter, and YouTube. Social media sites offer an alternative channel to receive Lex news, announcements, updates, and content. In addition to keeping Lex's followers up to date, social media opens up a platform for engagement and conversation with Lex. It's time to get social. Follow us, "like" us, and join the conversation. Last month we asked: The EV1 is an electric vehicle produced by General Motors in the mid to late 1990s. Most EV1s were scrapped after the EV1 program was ended. Which university or universities in New England currently have a General Motors EV1? The correct answer is - In 2001 Saturn corporation a GE division donated the EV1 to WPI | Worcester Polytechnic Institute as part of a program to promote electric car awareness and research. This month's question is: Which famous Hollywood actress was also an electrical engineer whose patented technological innovations are still in use today? Click here to answer this month's Trivia Quiz for your chance to win Lex swag!